In a saucepan, heat sugar and 1⁄4 cup water over low heat until the sugar is dissolved. Cool completely. Then combine the rice vinegar and set aside. Prepare the pickle by finely dicing all the ingredients. Pour over the pickling syrup then mix thoroughly. You’ll want to do this only about 20 minutes before serving. Combine all ingredients besides the tomatoes in food processor. Blend until finely chopped and has formed into a paste (you may need to add some water to form the paste). Add sambal and the tomatoes and cook until fragrant and lightly browned, stirring constantly and for about 8 minutes. Add 1 cup water (or less depending on consistency); reduce heat to medium flame and simmer until most of the water is absorbed and the mixture is a thick paste. Be sure to keep stirring. Preheat a barbecue grill or oven grill to medium-high. Using scissors, cut prawns in half lengthways, cutting from the spine inwards. Leave legs and heads intact in the shell as you cut. Open out prawns from the incision and flatten. Season with salt, pepper and olive oil, then set aside. 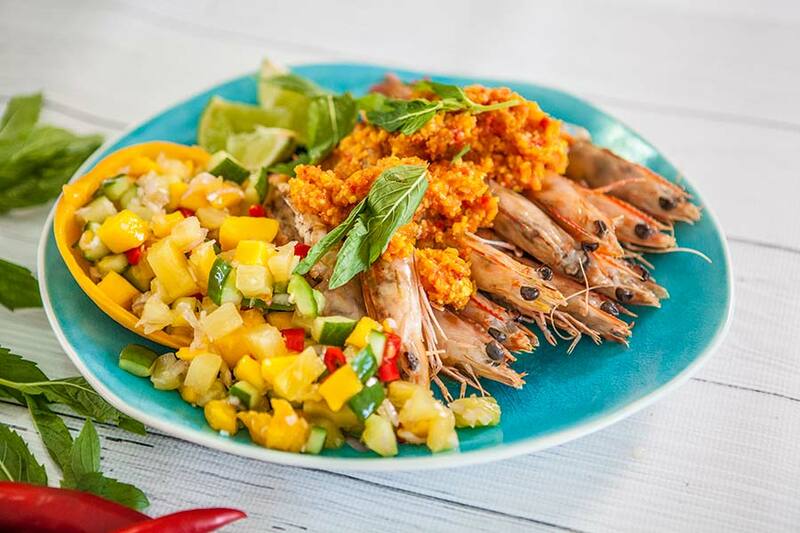 Grill prawns for two minutes on each side, then remove from heat and arrange on a serving platter. Spoon over sambal and drizzle with lime juice and top it off with some mint to serve.